“Crosswise” Nominated For An Anthony Award! I was blown away to find out that my first Tommy & Shayna Crime Caper, CROSSWISE, was nominated for the “Best Novella” Anthony Award. The Anthony Awards will be voted on by attendees at the 2017 Bouchercon world mystery convention being held in Toronto from October 12 to 15. I’m thrilled to share the honor with fellow nominees Angel Luis Colon, Sarah M. Chen, John Shepphird and B.K. Stevens. Thanks to everybody for the kind notes of congratulations! 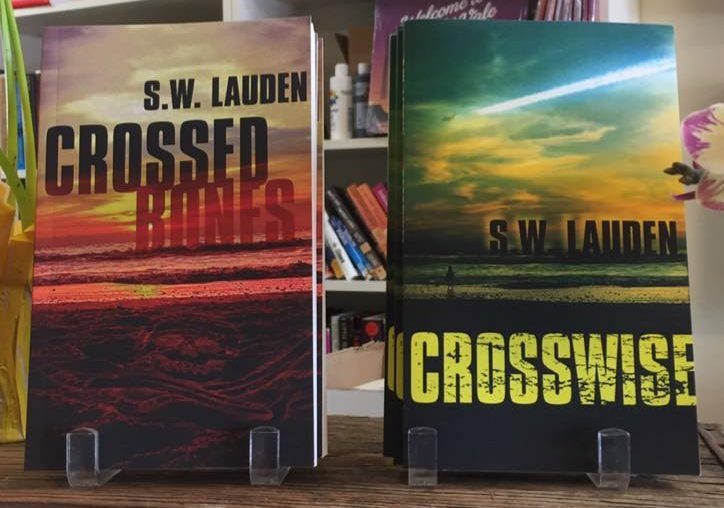 If you haven’t read CROSSWISE yet, it’s a crossword puzzle-themed crime caper that follows the misadventures of disgraced NYPD officer Tommy Ruzzo. Things spiral out of control when Ruzzo chases his girlfriend to Florida where he’s named Head of Security for a beachfront retirement community populated by wisecracking New Yorkers. Ruzzo is stranded among the local losers until he discovers a murdered senior citizen on the bocce ball court. 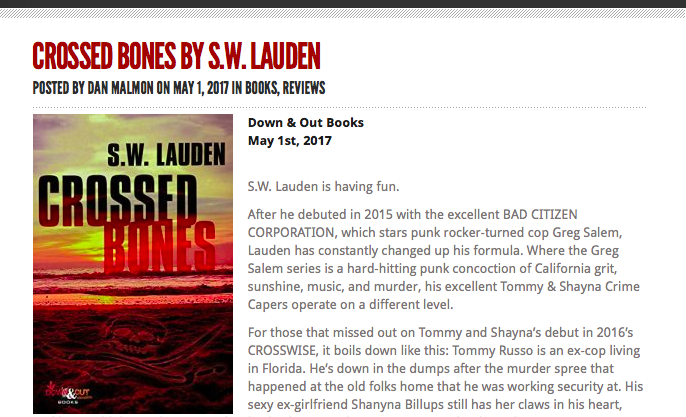 The second Tommy & Shayna Crime Caper, CROSSED BONES, was just published last week by Down & Out Books. 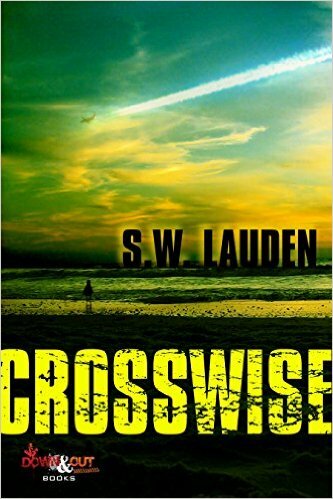 In addition to the Anthony Award nomination, CROSSWISE is currently in the running for a Silver Falchion Reader’s Choice Award. That one is open for public voting now, and anybody can vote (CLICK HERE). Winners will be announced at the 2017 Killer Nashville Guest of Honor and Awards Banquet August 24 to 27. S.W. 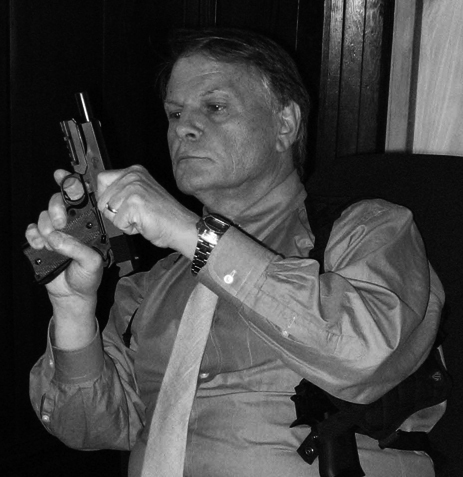 Lauden writes the Greg Salem punk rock P.I. series including BAD CITIZEN CORPORATION and GRIZZLY SEASON (Rare Bird Books). 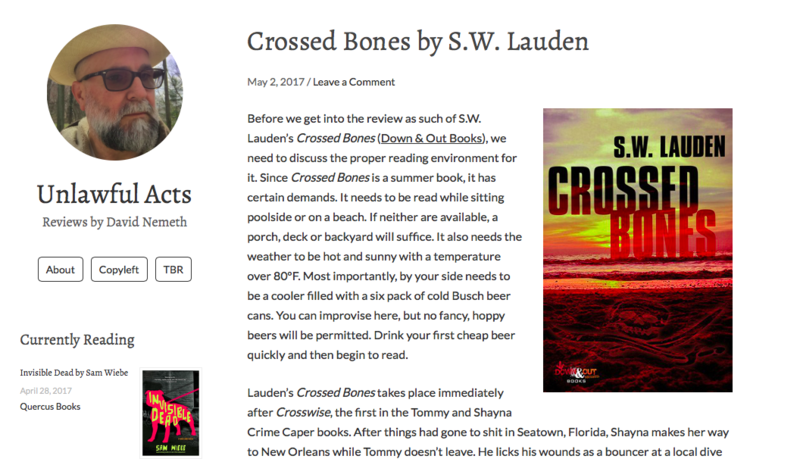 His Tommy & Shayna Crime Caper novellas include CROSSWISE and CROSSED BONES (Down & Out Books). He is the co-host of the Writer Types podcast. Steve lives in Los Angeles. This entry was tagged #amreading, awards, Best Novella, Boucheron, Crossed Bones, Crosswise, Down & Out Books, Killer Nashville, novella, Reader's Choice, Shayna Billups, Silver Falchion, Tommy & Shayna Crime Caper, Tommy Ruzzo, voting. Bookmark the permalink.